“It goes fast.” If one more well-meaning person told me motherhood goes fast I thought I’d explode, right there in the checkout line at Target. Forget about a toddler tantrum, shoppers would bear witness to a bona fide mommy meltdown. Really? It goes fast?! Because it just took me 30 agonizing minutes to get out of the car and into the store with a toddler and an infant. And after loading them and the well-stocked diaper bag into the cart there’s no place to put what I came for. All I want to do is pay for my purchases and go home but halfway through the checkout line my toddler announces with urgency that he has to go to potty. There goes another 30 minutes, and I can promise you it won’t go quickly. It goes fast? What reality are you living in? Obviously not mine. Everything about my life is slow and cumbersome. One shopping trip requires careful strategic planning around meals and naps, prophetic packing and ultimately consumes the better part of a day. I don’t remember when I went from hearing it to saying it. It went fast. If it hadn’t been a considerable amount of work getting rid of it I might be convinced everything simply vanished. My carefully stocked and well-organized nest is now almost empty. And, surprise, it turns out it wasn’t about the ubiquitous stuff, or even how quickly and efficiently we moved through the material world and our crazy overscheduled lives. It sounds cliché but it is true: it’s about the moments. I got glimpses of this Reality, the fleeting and sacred nature of motherhood. Before I even left the hospital with my newborn, an older nurse told me it goes quickly, without uttering a word. She picked up my baby like a priceless work of art, breathing in the scent of him like the distant memory of a spring day, and cuddling him like a cloud that could evaporate at any moment. It goes fast, she said in a way that stayed with me. A few years later I had a spiritual experience with those pesky shoes. I don’t know exactly how to explain it but when I looked at them I didn’t see shoes, I saw love. The veil that separates the material from the spiritual was pulled back and I glimpsed the Truth. The shoes were a sign that pointed to a deeper and more important reality: a little boy lived in my house! Temporarily. A beautiful, sweet soul, and an incredible gift from an invisible God. Knowing how quickly my son outgrew his shoes it occurred to me that those little boy shoes wouldn’t decorate my home for long and I ought to be grateful. Suddenly I loved those shoes scattered disorderly by the door. 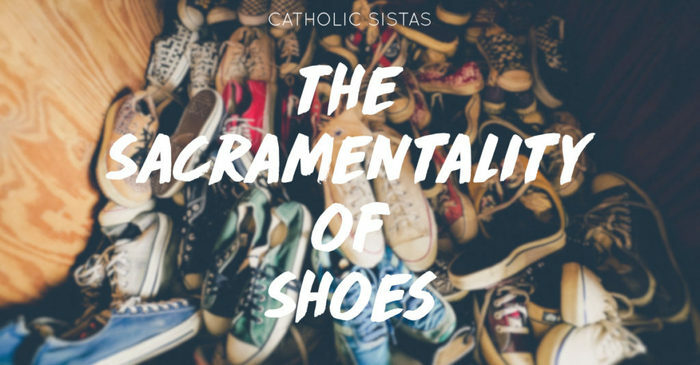 As a Catholic I am familiar with the sacramentality of the material world. I am encouraged not to reject the physical but to embrace it as a doorway into the eternal. To be in the world but not of it. I get it. Motherhood is messy and loud, simultaneously unpredictable and monotonous. It’s obscenely expensive and infinitely time consuming. It is limiting and overwhelming. And insanely sacrificial; a total emptying of oneself into another until there is absolutely nothing left to give and you’re no longer sure where you end and the other begins. It is the essence of Christianity. The truth is it’s a privilege to hold a newborn, let alone to be given one to raise. The enemy of all that is good does his best to convince us that it’s a burden. But he is liar. Do not be deceived. Don’t let him trip you up over the shoes in the doorway and steal your blessings the way he does best, moment by moment. Whatever the cost, the graces are greater, I promise. Count them. Daily. You’ve got this, mom. Your are the perfect mom for your child. Of all the mothers that ever were or ever will be, God chose you to be the mother of his child. Trust me: the days are long but the years are fast. Signed, the aggravating older woman in the checkout line.